In front of their hometown Duval crowd, Jacksonville opened the newly-named TIAA Bank Field with a defeat of the New England Patriots for the first time ever in the regular season, giving the Jaguars only their second win in 13 tries against the Patriots. This also served as Jacksonville's first win over Tom Brady. 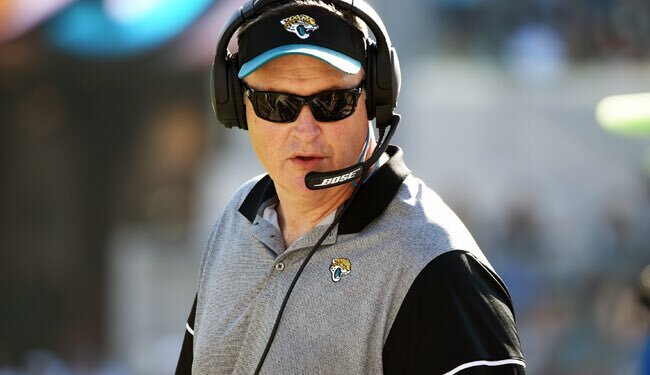 During this campaign, the Jaguars lost the following starters: wide receiver Marqise Lee, left tackle Cam Robinson, left guard Andrew Norwell, center Brandon Meester, tight end Austin Seferian-Jenkins, and tight end Niles Paul. Jacksonville has also been hampered by injuries that have come to their backup offensive linemen and at times to other starters, right guard A.J. Cann and right tackle Jermey Parnell. Jacksonville has also had to play without all of their special teams' returners, with wide receiver Jaydon Mickens and running back Corey Grant out for the season. With all of these protectors and weapons off the field, offensive coordinator Nathaniel Hackett was asked to do more with a whole lot less. The team would go on a seven-game losing streak and Hackett would be let go in only his second season as the official offensive coordinator of the team. Starting quarterback Blake Bortles would be benched at the same time, and the Jaguars would turn to former Cleveland Browns' quarterback Cody Kessler. Jacksonville had gone from winning a franchise-elevating game against New England to opening the doors to TIAA Bank Field for a home finale that saw the Jaguars already eliminated from playoff contention. The game between Jacksonville and the visiting Washington Redskins began with both teams trading punts before Redskins' kicker Dustin Hopkins connected from 46 yards away to put the first points of the game on the board, 3-0 Redskins, with 1:50 to go in the first quarter. Jacksonville began the game with a fumble by Kessler that was forced by linebacker Ryan Kerrigan and recovered by rookie nose tackle Daron Payne. The Jaguars would punt on three straight drives after that. Former Redskins' kicker Kai Forbath was signed this week by the Jaguars and made his first-ever field-goal try as a member of the Jaguars when he booted the ball home from 33 yards away to tie the game at 3-3 with 3:22 before half. Both teams combined to punt nine times in the first half of play, the Redskins with five and the Jaguars with four. But Jacksonville punter Logan Cooke booted a beauty down the field on his fourth punt attempt, this from deep in his own territory to what would be the 18-yard line of Washington after punt-returner/wide receiver Maurice Harris would muff the return and recover the ball. The Redskins' fifth punt of the first half would go to punt-returner/wide receiver Dede Westbrook who fielded the ball and rolled out right, turning the corner and jetting forward with a final block from Greene aiding him into the end zone for a 74-yard return for a touchdown, giving the Jaguars their first lead of the game right before half, 10-7. Washington opened the second half by taking seven minutes and 28 seconds off the clock, capping their drive with a 33-yard field goal by Hopkins to bring the score to 10-6 Jacksonville with 7:32 to play in the third quarter. With under four minutes to go in the third quarter, rookie defensive end Taven Bryan, a Florida Gator, achieved his first National Football League (NFL) sack, taking down Redskins' quarterback Josh Johnson. Jaguars' cornerback D.J. Hayden ended the Redskins' drive when he got to Josh Johnson who was scrambling toward the first-down marker, forcing the Redskins to punt for the sixth time of the game and first time in the second half. With 15 minutes to play, Jacksonville had the ball on their own 42-yard line on 1st-&-15. During this drive, on 3rd-&-5, Kessler rushed for 21 yards for the first down and much more, getting to the Washington 27-yard line. Kessler would get Jacksonville to the 23-yard line and Forbath would connect on a 41-yard field goal to end the drive, placing the Jaguars ahead 13-6 with 11:16 to play. On the Redskins' next drive, wide receiver Jamison Crowder made an acrobatic play on the ball, tipping it up wtih his right hand and staying with it, reeling it in by the Jaguars' redzone. This drive would end would end by a pass from Johnson to tight end Jeremy Sprinkle who would roll out right and outrun middle linebacker Nick Deluca to the end zone for a six-yard touchdown that would tie the game at 13 all with 5:47 to go. On the first play of their following drive, Jacksonville would go to second-year running back Leonard Fournette who would fake left, drawing most of the players to that side and then switch fields for a 25-yard gain to midfield. Going run after run, the Jaguars then decided to throw on 3rd-&-6. Kessler, in a crowded pocket, got the ball out, finding Westbrook who went for a first down and more, but the play was negated due to an offensive pass interference penalty that made it 3rd-&-16 instead. Kessler would overthrow his receiver on the very next play and cornerback Fabian Moreau would intercept him, negating more than a play and instead negating the entire Jacksonville drive, giving Washington the ball on their own 45-yard line with under three minutes to go. Redskins' running back Adrian Peterson had 15 carries for 24 yards in the game before the Jaguars gave up 15 yards on one single carry inside 1:30 to play. Jacksonville allowed more yards on this final Redskins' drive to Peterson (27 yards) than the entire amount of time of play prior to this drive (24 yards). With three seconds to go, Hopkins sent his third field goal through the uprights, this from 36 yards away to win the game 16-13. Washington improves to 4-3 on the road and 7-7 overall, still in the hunt for a playoff berth. The Jaguars finish 3-4 at home and are now 4-10 on the season, a season just months removed from being four points away from a SuperBowl bid.